Fill My Cup is a weekly Bible and Beer review where I share notes from a Scripture passage and a critical review of a featured beer. 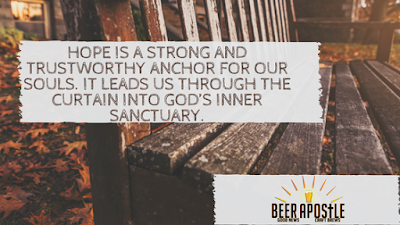 May this series spark discourse, reflection, and promote new learning about craft beer and the Bible. I invite you to engage with me--share your thoughts, comments, and your musings! Faith is confidence in what we hope for and an assurance of what we do not see. Hope is the strong an trustworthy anchor of our faith--hope grounds us in Christ. Hope allows us to see past current circumstances because of our belief in Christ and trust in what is yet to come. If you're like me, maybe hope is the very thing that got you through this past election cycle. While half of the country seems to be living in fear of what is yet to come, Christ-followers have an assurance that God is in control and can, therefore, hope for great things on the horizon despite (or in spite) of whatever the circumstances may be. Hope transcends fear, worry, doubt. Regardless of whatever you're going through, remember the promise found in Hebrews 6:19-- Hope leads us through the curtain into God's inner Sanctuary. Our Special Ale is Anchor Brewing's annual seasonal release. Each year, the recipe changes ever so slightly to bring a nuanced flavor to close out the calendar year. This 2016 batch is Anchor's 42nd release of what has now become a seasonal tradition. 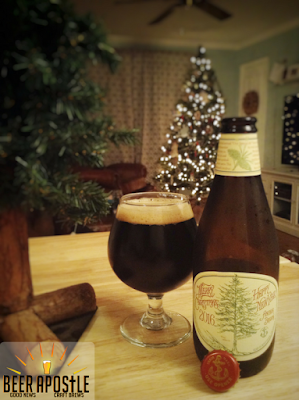 Just as the recipe changes every year, so does the hand-drawn Christmas tree seen on label in the picture above. While the craft beer "movement" in America is still fairly young, This California-based brewery brings decades of tradition to the shelves with this holiday release. Our Special Ale pours a picturesque dark brown, almost black, color with a light head that laces the glass beautifully. The beer gives off a semi-sweet aroma of molasses, caramel, and hints of pine and roasted malt. Spices and sweet molasses lead the initial charge of flavor, followed by caramel, dark fruits, burnt sugar and an earthy hop finish. As the beer warms, the holiday spices and wood notes become more dominate on the palate; the initial sweetness takes a backseat. The 2016 release of Our Special Ale is one of the better recipes they've released in recent years. Layers of flavor and complex characteristics make this a fun beer to sip and enjoy. Black friday deals are the most attractive deals for all of us and especially the women. But foods also are offering that is quite new for me.